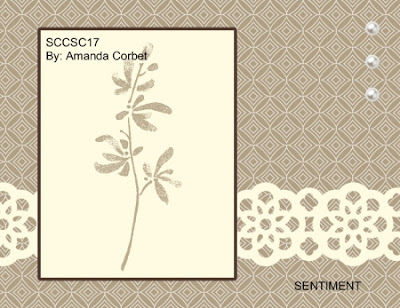 I started off with a piece of Wisteria Wonder card stock cut at 5-1/2" x 8-1/2" and scored at 4-1/4". Next I cut a piece of the text Wisteria Wonder DSP 4" x 5-1/4" and adhered it onto the card front. I stamped the greeting from Field Flowers in Basic Black ink in the lower right hand corner of the DSP. Next I cut a scrap of Whisper White card stock down to 5-1/2" wide and used the Large Lace Ribbon Border Punch to cut the decorative border. 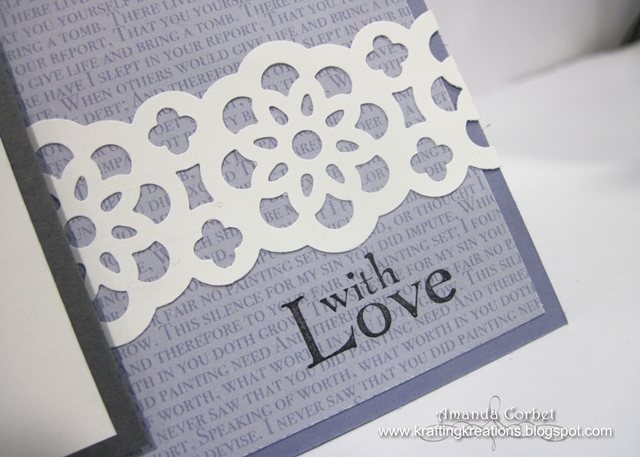 Then I adhered the white lace onto the bottom portion of my card front. Unfortunately this beautiful punch is one of the many things that is being retired this year. This punch will only be available while supplies last, so if you haven't ordered it yet click my shop now button on the right tool bar and get it ordered before it's gone forever! For the flowers panel I cut a piece of Whisper White card stock 2-1/4" x 3-1/4". The flower stem was stamped in Lucky Limeade ink. The first step of the flowers were stamped with Wisteria Wonder ink. The second step of the flower I stamped in Perfect Plum ink and used the Stamp-A-Ma-Jig to get them lined up just right. I adhered the stamped card stock onto a 2-1/2" x 3-1/2" piece of Basic Grey card stock and adhered this panel onto the card front with Stampin' Dimesionals. I had accidentally rocked the second stamp on the smaller flower image and got a little bit of the rubber line so I decided to cover it with a butterfly. I used the Butterfly Sizzlit to cut the Wisteria Wonder butterfly and the Whisper White butterfly was left over from another project. 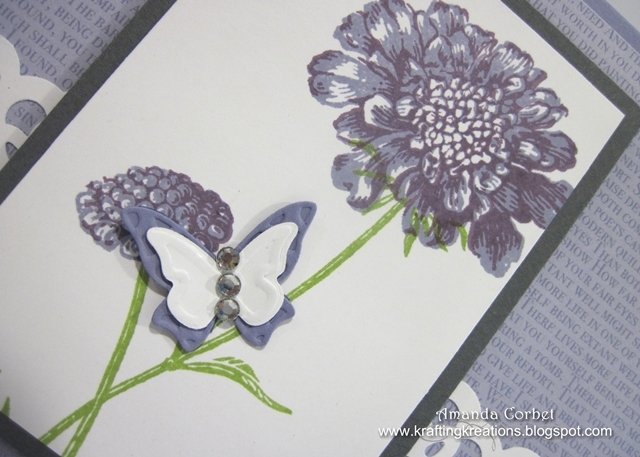 I used my handy dandy Two-Way Glue Pen to glue the butterflies together and onto the card. Finally I added three rhinestones for the butterfly body and three larger rhinestones in the upper right hand corner of the card. I just love how this card turned out! It really came together pretty quickly. Sometimes I struggle with sketches and other times the cards practically fall into place! Do you like to use card sketches? Have you had any projects lately that practically fall together on their own?